I read this article and found it very interesting, thought it might be something for you. The article is called Disqus vs Livefyre – Why I Switched My Blog’s Comment System and is located at https://www.ben-johnston.co.uk/disqus-vs-livefyre/. When I put this blog through a major redesign a couple of months back, one of the main things I wanted to do was encourage more comments. There were a few ways that I tried to do this, and it seems to be working, slowly but surely, but it wasn’t just more comments that I wanted. Oh, no – I’m greedy – I wanted more high quality comments, or at least ones that made some sense. That’s why I made the switch to Livefyre. Previously, I was using Disqus, which is one of the most popular commenting systems out there. It’d been recommended to me by a couple of people for one of my older sites and it was definitely a big improvement over the stock WordPress comment system, so I made sure to install it on here when the site went live. For a while all seemed good; I was getting some comments, I was finding the single sign-in really handy when I wanted to comment on other sites that used it and everything was rosy. Then I started actually looking at what it was doing for my site: not much. The problem I found with Disqus is, in many ways, also its strength: there are loads of people using it. The barrier to entry is very low, and since so many people use it, you’ve – in theory – got a better chance of people leaving you a comment when they find your post. Brilliant! The downside is that with the barrier to entry being so low, you don’t always get the kinds of visitors you’re hoping for. So many of the comments I was getting through Disqus were either non-contributory, spam or just illiterate rudeness that most of my time spent managing comments was deleting them. I got a few good comments, but not that many, so when I was plotting the redesign, I decided that I’d look into alternatives. 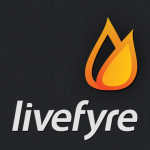 Enter Livefyre. It’s tough to surf blogs these days without coming across Livefyre; this real-time commenting system is seeing wider and wider adoption recently, and it seems like there’s a good reason for that. A few blogs I read regularly use it and I’ve always been struck by the quality of the comments and the interactions there. Of course, a commenting system doesn’t build a community, but if the people using the commenting system are smart people that want to contribute, it really can’t hurt. I’ve definitely been getting more comments – the kind I actually want, contributory, well-thought-out ones – since making the switch. Now I’m not sure if I can completely attribute that to switching to Livefyre from Disqus; I’m sure the shiny new eleven40 Theme (affiliate link), the improved rate of posting, the fact that my latest few posts seem to have been popular and that I’m actively trying to engage with other bloggers via their own comment systems (when I have time) will have something to do with it, but I’m not complaining. Livefyre also has single sign-in, meaning I can comment on other blogs that use it without much hassle and, as I say, a lot of blogs I read are using it, so that’s definitely helpful. It also has a range of social options, meaning you can converse over other social networks like Twitter or Facebook. This is good because it can actually turn your site into a “hub” of sorts, if that’s what you want. I also think it looks better than Disqus, although some people may disagree. Disqus does have its advantages, however – not least the fact that it’s got an Android app. This is something that I’ve asked the Livefyre dev team about on Twitter before and they tell me one’s on the way, which makes me happy. I also really liked the fact that Disqus would show who Tweeted a post below the comments. I haven’t found a way to do that with Livefyre yet, although it might be in there somewhere. As I’ve said, the real clincher between the two for me is the quality of the comments. I don’t know if it’s the fact that fewer people are using Livefyre yet, but since making the switch, I haven’t had to delete a single comment on the grounds of spam and everything that’s come through has been contributory. You don’t need to agree with me to comment here, but if you’re going to disagree, try doing so in a constructive manner, or at least in a way that makes sense. All told, Livefyre is a great comment system with an extremely powerful real-time engine, a nice looking UI, a smart bunch of people using it and excellent service from the team. There’s plenty of upsides to using Disqus too, but I made the switch and I’m glad I did. Thanks for reading my morning ramble. Which comment system do you prefer? As you may have noticed, I’ve now removed Livefyre. Why? I talk through some of the reasons here, but the main one was simply spam. For all my talk of moderation in this post, spammers (as is their wont) found a way to get free, do-follow, unremovable links from my comments section by hitting “Like” on every single comment. When you can’t remove those Likes, can’t remove those comments on the go due to the lack of mobile app and see the “conversation” delving into illiterate spam (again), you know it’s time to move on. I’ve now gone back to Disqus. The new version seems to have significantly less spam, which is nice, although they’ve removed their Android app which is a bit annoying. The experiment with the Do-Follow links in default comments didn’t really work out – I was having to flag comments as spam about fifty times a day and people were telling me that they don’t really like commenting through the default system, even though they were getting a link out of it. So there you have it. The site’s currently back on Disqus. One day, I may switch again, I may even go back to Livefyre if they improve their spam protection, but for now, that’s how it’s staying. How about you? Have you made the switch back? Any other comment systems I should be looking at?